Since many of our users have asked me how to use tags in Yanado, we have decided to create a list that will serve just as a starting point. I know, we should invest more energy into educating our users about Yanado’s features and benefits, but due to constant user interface improvements, it’s really hard for us to keep up with so many changes. This post is the first chapter in the series of How to Use Yanado In Order to Organize Your Work. Here is the list of 4 ways on how you can use tags in Yanado. Three of the four examples listed here show how we use tags in our company, while that other one, describes how they were put into action in the company I’ve worked before. Yanado has several todo list: Development for product development, Content for content marketing, Design for design related tasks, Fundraising and Administration. Thanks to a constant task overload, we found ourselves in a situation where we needed to add a new layer of organization to help us become more efficient. In development list we use tags to mark weekly sprints (you can call them milestones, epics, whatever you like). Weekly sprints are sets of tasks that we plan to do in that particular week. Although those sets are dynamic, 80% of our week is pretty much planned ahead. Today’s active weekly sprint is called #7300. It may seem a bit militaristic, but it really isn’t. At the beginning of Yanado, our CTO @savic.prvoslav named the first sprint #1000, because he thought that after we’re done with it, we’ll have around 1000 active users. We just picked up the nomenclature and right now, this “trend” has nothing to do with the number of users. Next week’s sprint will be called #7400, and so on, and so on. For instance, If you type in the term #7300 in the Yanado search bar, you’ll be able to see only task from that sprint. 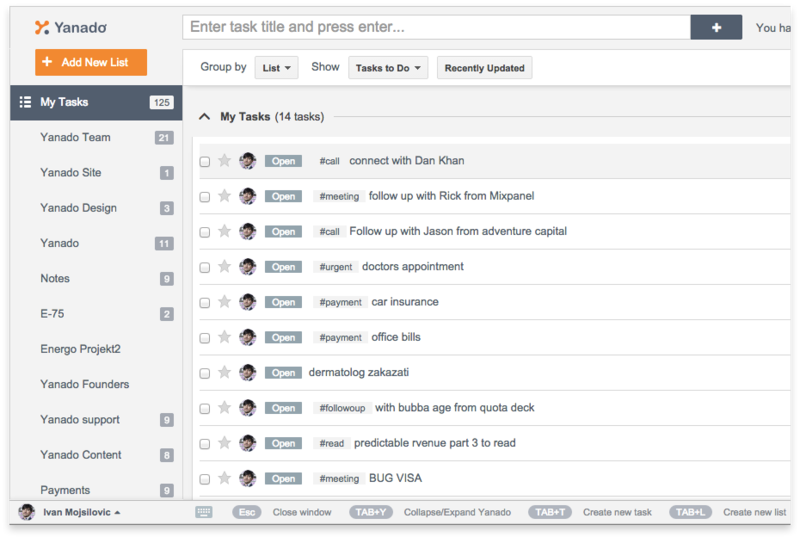 You can also group tasks per tags, and you can see tasks grouped by sprints, as well. You decide which view works better for you. Besides sprints and milestones, tags are great for giving additional info about the tasks in a flexible way. #urgent – get it done now. This tag usually has a followup star on it to avoid any possible misunderstandings. #high – if there are no urgent tasks, our teammates should focus on those that have #high priority first. 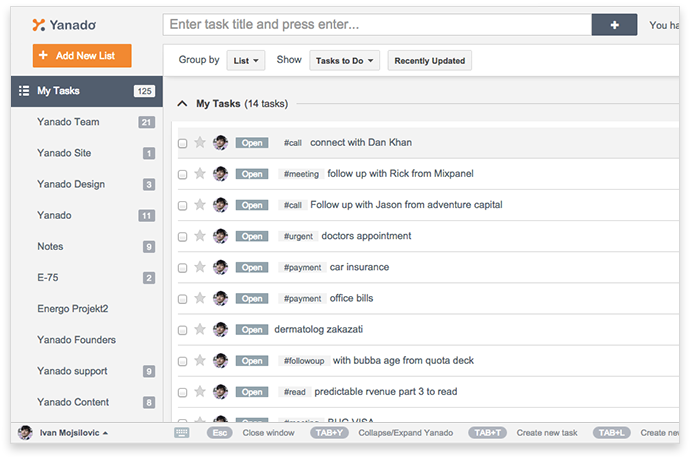 #low – in case of no urgent or high priority tasks, our teammates should jump onto these ones. Frankly speaking, I don’t remember if there ever was a situation where we didn’t have any #urgent or #high priority tasks to deal with. We don’t need any more priority levels. The job of our project manager is to set sprints and milestones, and rank priorities on tasks that need to be done ASAP. More priority levels, next to these 3, would only create chaos and confusion. At least that’s what we think. Not all tasks are doable with the same amount of effort. Some are easy 1h jobs, while others tend to take a few weeks of your life. Although we at Yanado don’t use tags to mark how difficult a certain task can be, at my previous company, we had a habit of doing exactly that. I used to work for this development company called Intens, who made it possible for me to work in PeopleClick Inc’s integration team (everything in their ecosystem had to go through our integration code base and server). They had 7 different apps for various HR needs, and we had to sync all of them in our integrations server. Not to mention more than 50 external integrations per year. Each engineer had the responsibility of giving us an insight on much time he’ll need to complete a specific task. Every single engineer was also asked to describe just how difficult a certain thing is to do, from a technical perspective. This kind of info helped our manager understand how to organize his team in a much better way. #hard – it meant no interruptions for an entire week. We rarely had single tasks that used to take more than a week to accomplish. #medium – it meant that we could do it in 1-3 days. The majority of our general tasks was in this kind of range. #easy – less than a day. The more experienced you are at your job, the less #easy tasks you’ll get. Our manager used to assign more experienced teammates to #hard tasks in order to optimize our general delivery time. I must say our manager Mike Bowman was one of the best, if not THE best, managers I have ever had the opportunity to work with. Before Yanado had any team collaboration (share tasks) features, it was good for personal organization, and it still is. I have a list of tasks related to my personal work and need. In order to get myself organized better, I use tags to group similar tasks. 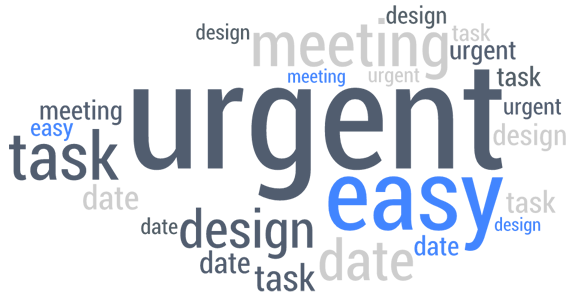 #meeting – I put the tag #meeting to each task related to meeting someone on work and non work related basis. That’s how I can see all the meetings I have when I search or group tasks by tags. #call – same as for meetings, I tag all the tasks that requires me to make a call. It could be a sales call, friend call, spouse call, investor call etc. If there’s a call involved, I tag it with #call. #urgent – this one is also quite obvious. If there’s anything that I need to take care of immediately, I tag it with #urgent. It’s similar to how we use priorities in team lists. We gave you 4 ways on how you can use tags in tasks, based on our experience. If you know more ways on how we could use them, please write those ideas down in the comments below or send us a direct mail, and we’ll add your input to this list. Feel free to share, cause your ideas could help a bunch of people out there be better at what they do. Remember, helping people is one of the most fulfilling experiences a human being can have.